Spurned on by my first success on home brewing my first batch of beer, I soon got together a plan to make up a second batch. Given that my wife wasn’t fond of the dark and hoppy ale I crafted last time, the plan was to make something light with half the hops and easily drinkable. That was the plan at least. I went into Main Street Brew Supply in Hillsboro and let them know my plans. We talked about the virtues of hefeweisen beers in both American and German varieties. I was leaning more towards the delicate flavors of banana and cloves that only a German beer could offer, but to play it safe I chose a nice standard American hefeweisen in the tradition of the Widmere Brothers. With the ingredients home I started prepping by making sure I had all my supplies in order. For the most part I had everything good to go, except for the need to de-label a few more bottles. A 5 gallon bucket in the garage with a scoop of Oxi Clean in it did wonders and takes labels off easily within 24 hours. There’s always the need to rinse them really well after this though. Certainly didn’t want my beer tasting like fresh laundry. Then it was brew day. One Sunday afternoon I decided to take advantage of a lull in our family’s activities and start this batch running. I got everything rinsed out and properly washed, then started up the boil with a couple socks of wheat in the pot. I noticed right away that the warming water was turning cloudy with the addition of wheat berries, something that did not happen in my previous ale. Soon the bottom of the pot couldn’t even be seen and the aroma reminded me of baking bread. Before I knew it I was on to adding the malt extract and hops, cooking it all into a wonderful wort for the one hour of boil time. I noticed a pronounced stickiness to this batch over the prior amber. No doubt caused by the sugars in the wheat verses just straight malt extract. Pouring the wort into the 8 gallon fermenter I noticed the color looked delicious, and during the next 4 days it bubbled like mad as the yeast went and did all the fermenting work for me. On transfer to the secondary fermenter (carboy) the color was a classic gold of a hefe, though darker than I expected. The baking bread aroma continued with the combination of both wheat and yeast wafting up my nose. With patience I waited for the bubbling to slow down and late one night decided to bottle it up. Waiting for the dishwasher to finish it’s ultra-high heat wash of the bottles proved to be the largest hold up. Next time I have to note to start that as soon as I think I want to bottle that day. After adding a cup of snow white corn sugar to the batch we bottled it up without incident. I did notice however that it was still stickier than the previous batch, and any spills on the outsides of the bottles dried tacky. Without much thought I put most of the bottles in a large box and set it in the garage. By this time it was well into late fall and I hadn’t considered that there would be a difference in the garage from the last time I brewed in July. After about three weeks (which happened to be exactly Thanksgiving Day from the date I bottled) I put a couple in the fridge and tried them out. They lacked something. That something was carbonation. I tried a couple different bottles. Though the beer wasn’t bad, it lacked character since it was already a light beer the lack of bubbles made it feel like you were drinking a day old opened beer which was then chilled again. I pondered about this conundrum. Where had I gone wrong? Then later when I walked into the garage to get something else it struck me. The garage was cold. Very cold. Ale yeast like I was using really works best if it is up around in the 70’s, not the low 50’s and 60’s that our garage was running at in the late fall. Bugger, what was I to do with all this flat beer? I read online forums for a bit and came to the conclusion that yes, I had stunted the yeast since it was in the cold garage and it wouldn’t really carbonate there. I had moved some bottles into the cabinet of the downstairs bathroom (just in time for my mother-in-law to visit and use it daily) but it still wasn’t getting enough reaction with my several taste tests. Finally I resorted to the ultimate conquest of the beer carbonation game: the top of the fridge. Given that the heat rolling off the fridge will keep it at a nice toasty upper 70’s all day and night this would supposedly give my beer the kick start it needed, assuming the yeast hadn’t completely died off in the process. Well, after a couple more weeks up there with a test batch I ended up with mixed results. Some showed promise of bubbles when poured into pint glass, others were barely up to the fizz. For the most part, this batch is a wash. It didn’t end up light enough for my wife to like, though it did have far less bitterness due to the lack of hops. Furthermore, since the hefe didn’t have the carbonation that people so fondly seek out in an American hefe, it is doubly dissatisfying. What I ended up with, as best I can describe it, is an “English style dark hefeweisen”. Not really what most people are usually looking for, so I guess I’ll have to “suffer” through the remains of the 50 bottles that this batch yielded. Better luck next time…perhaps a lager next? Doesn’t get much lighter than that. 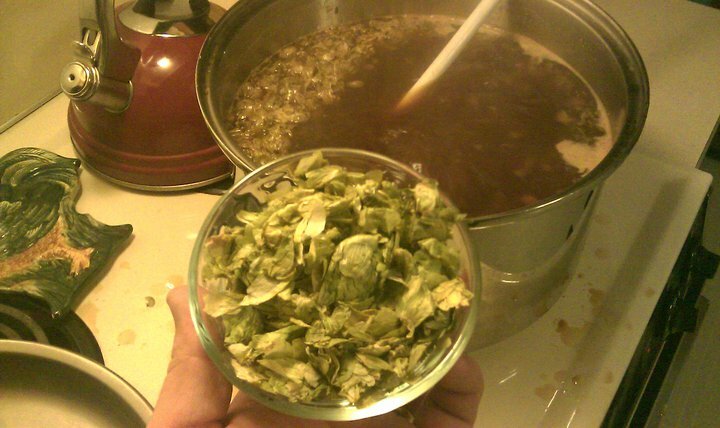 This entry was posted in Homebrewing and tagged beer, brewing, homebrewing, hops. Bookmark the permalink.